Can soup be controversial? I think maybe it can. I've served this soup at probably ten dinner parties over the past couple years. D sets the first bowl down on the table and announces, "tomato soup." Guests slurp their first spoonfuls, and the crows start coming. "This is amazing." "Best tomato soup ever." "I need the recipe." Music to any cook's ears; it's no winder I keep making this soup. It wasn't always this way, though. I blame the blue cheese. The first time I made this soup, I told guests I'd made a spicy tomato and blue cheese soup. Three people said they'd pass. As in, have no soup. At all. The rest of us tucked into our bowls, and in no time, we were oohing and ahhing over how smooth, how strangely deep and rich it was. No matter: the three holdouts remained unwaveringly uninterested. I learned the hard way that this soup does best with as barebones an introduction as possible. In this house, we call it tomato soup. Everyone loves tomato soup; no one asks any questions. If you don't know there's blue cheese lurking within your bowl, you'll never guess. You'll just take your first spoonful, then your second. And if you're anything like me, you'll declare this the bes tomato soup you've ever had. This soup is heady and flavorful - so much so that it can withstand a few adaptations. To wit: the recipe calls for whole canned SM tomatoes. I've only ever used the whole ones, but this time I only had crushed on hand; no problem. Also, I've made this recipe with stock only once, and it was vegetable stock; the other times, I've used water with no problem at all. Lastly, this time I did actually manage to find the Roth Käse cheese, but in the past I've used other cheeses. Again, no problem. Heat the olive oil in a large pot over medium heat. 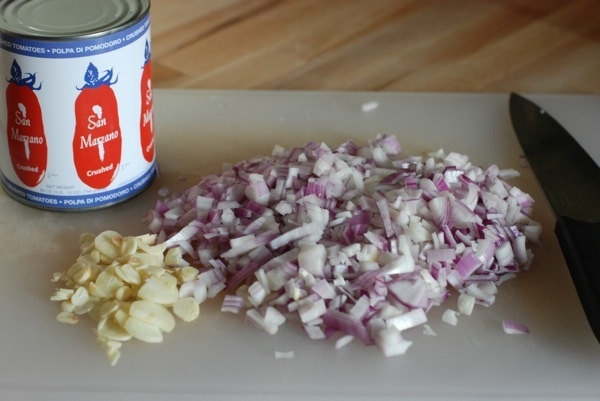 Add the onion and a generous pinch of salt and stir to coat the onion with oil. Cover and cook for 2 minutes. Add garlic, cover the pot, and cook for 2 minutes more. Add the tomatoes and their juices and the stock or water, and bring to a simmer. Add the cream, sriracha, and oregano and simmer gently (on medium-low heat) for 45 minutes.